When Stacey and Brad Warden joined Jackson County 4-H as youth in the early 1990s, they had no idea what lay in store. Both being very competitive, they won their way to national competitions in poultry and livestock. In fact, Stacey was a member of the 1st place National Poultry Judging Team in 1994! They also just so happened to establish a relationship that saw them married in 1997. 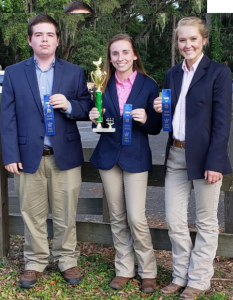 It’s no wonder that since coming back to Jackson County 4-H in 2014 as volunteers, that together they have fielded multiple State level teams in Meats, Poultry and Livestock Judging. This year, however, was their best yet. 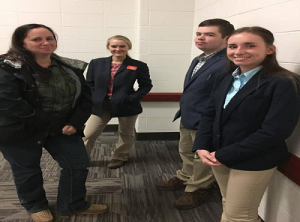 Their senior poultry judging team placed first in the State in May. Earning them the right to represent Florida at the National Poultry and Egg Conference in Kentucky on November 15th. Fast forward to September, time to get back to practice. They held practices in September but then Hurricane Michael hit on October 10, putting an end to any further practices and just about everything about our lives as we know it. But as the dust settled, just a week prior to the competition in November, enough money was donated to get the team registered and pay for lodging. 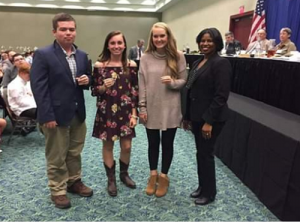 The families of the three-member team comprised of Emma Caraway, Hayden Warden, and Morgan Seale along with their leader and coach Stacey Warden made their way to Kentucky. To say that making it to this level of competition is a major milestone is an understatement. But when you factor in the family tradition and the determination to “Make the Best Better”, there was no doubt that the horrendous circumstances these youth had to overcome, would not stop them and that they would have excelled the way they did. As a team they placed 10th in the Nation in Poultry, 5th in the Nation in the Egg Division and Emma was the 20th High Individual in the Nation. This type of determination is a credit to the way these youth are being raised and a fine example of what participation in 4-H can do when you have a dedicated volunteer like Stacey Warden. She and these youth have overcome insurmountable odds and showed the Nation just what Jackson County 4-H has to offer!